An introduction to the game play. Be the first to collect 3 large silver presents! Whoever said it’s better to give than to receive never played My Precious Presents! In this game it is ALWAYS better to receive. This gift exchange is anything but civilized, mischief abounds as everyone races to collect the biggest presents. Remember to keep your eyes on your pile of presents or else you’ll end up with none! Play revolves around managing and protecting your presents while sabotaging other players efforts. There are 120 cards in the deck, so a good variety of actions, reactions and other game play is possible. You will have to pay close attention to other players victory conditions as once they are met the game is over. Quick easy game play attracts all level of gamers and non-gamers alike. The back stabbing and action/counter action should keep players constantly on there toes. 69 colorful foil wrapped presents create instant buzz from onlookers. 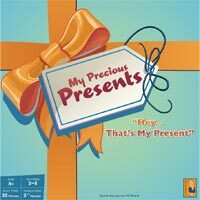 Add a Review for "My Precious Presents"